… graffiti does ruin people’s property and it’s a sign of decay and loss of control. Art is art, and nobody’s a bigger supporter of the arts than I am. I just think there are some places for art and there are some places [not for] art. And you running up to somebody’s property or public property and defacing it is not my definition of art. Or it may be art, but it should not be permitted. And I think that’s exactly what the law says. 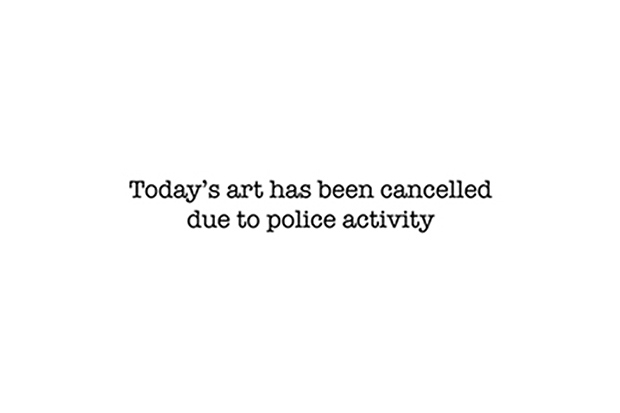 His site was updated this morning with a simple message that today’s installment of the ongoing city-wide exhibition had indeed been cancelled due to police activity.